Keep your kitchens and washrooms cleaner than ever by installing these touch-free hand paper towel dispensers. You can load these units with either c fold towel or multifold paper towel packs. In either case, the touch free bottom pull design helps to make sure that germs aren't passed around on the dispenser's surface, as can easily be the case with depressed lever dispensers. A simple flap flips down within the unit to move it from being a c fold towel to a multifold paper towel dispenser. The intelligent design prevents you from overloading the unit, which can cause jams or spillage. The translucent cover means that you can easily see when it's time to reload the dispensers, without having to open the units. This flexible and practical hand paper towel dispenser comes with a great five year performance guarantee from the manufacturer. You can store up to 400 C fold or 600 multifold towels in the unit, both of which are also available at ReStockIt.com. Flip-down plate instantly converts to dispense C-Fold, Multifold or BigFold® towels. Door ramp design prevents overstuffing. Covered key lock protects against waste and pilferage. Large capacity: 400 C-Fold, 600 Multifold towels or one package of BigFold® towels. Mounts with screws (not incl.). See-through plastic cover. Towels Dispensers Type: Folded Towel Dispenser; Color(s): Translucent Smoke; Depth: 5 1/4"; Height: 15 2/5". Translucent Smoke C-Fold and Multi-Fold Paper Towel Dispensers from Georgia Pacific! 717 In Stock today. Attractive - easy to install and fill with towels. Dispenses cleanly. Only negative is must be opened by a tiny - non-standard (and easily lost) key to refill. Cleaning and maintaining facilities is simple with the right janitorial supplies including cleaners, scrubbers, gloves, mops, brooms and more. 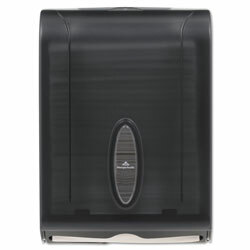 ReStockIt.com has combi fold vista towel dispenser available at up to 40% discount. Brooms, cleaners and mops are also available. ReStockIt.com is the source for janitorial and cleaning supplies.